North Korea yesterday accused the United States of ratcheting up tensions in the region, saying that any "tough countermeasures" that it takes against its long-time adversary would be justified. This came after the North fired a ballistic missile that flew over Hokkaido - the northernmost prefecture of Japan, a staunch US ally - yesterday morning, triggering sirens for residents to seek shelter and reigniting tensions after a lull. Stock markets across Asia and Europe tumbled, while prices of safe haven assets, including gold and the Japanese yen, surged. The danger has "grown significantly larger", said Japanese Prime Minister Shinzo Abe, who spoke to US President Donald Trump on the phone for 40 minutes. They agreed on the need to further tighten the noose on North Korea, as Mr Abe ruled out dialogue. Mr Trump said later in a statement: "All options are on the table." He also said the world "has received North Korea's latest message loud and clear: This regime has signalled its contempt for its neighbours, for all members of the United Nations, and for minimum standards of acceptable international behaviour". South Korean President Moon Jae In, who has been seeking rapprochement with the North, has ordered an "overwhelming" show of force in retaliation. The situation alarmed China, with Foreign Ministry spokesman Hua Chunying saying it is at a "tipping point" and calling for restraint and dialogue. Moscow said it was concerned with what seemed to be a "tendency towards escalation". This was the third time North Korea has fired a missile over Japan into the Pacific, following launches in 1998 and 2009. 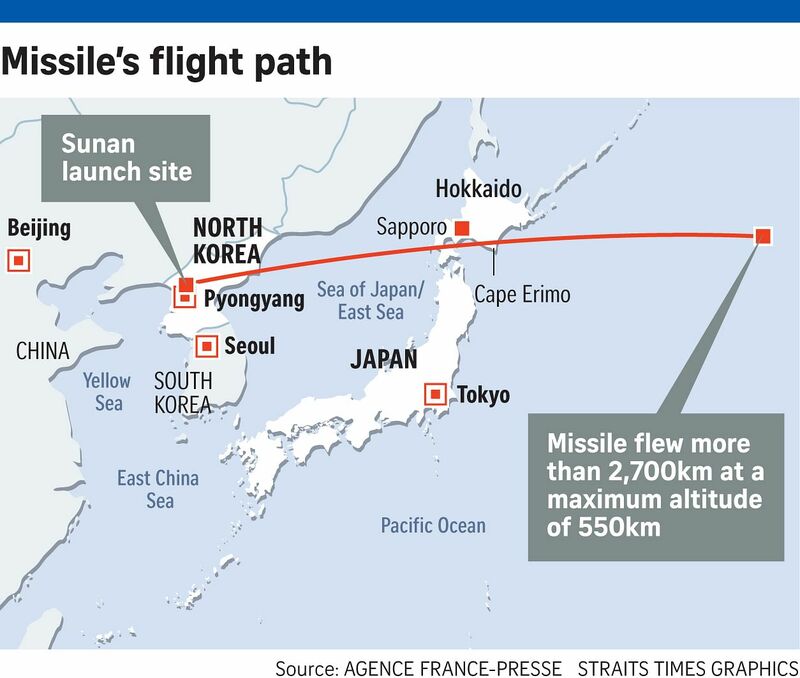 It also fired rockets over the Okinawa island chain in the south in 2012 and last year. An emergency United Nations Security Council (UNSC) meeting was convened last night. Yesterday's missile, thought to be an intermediate-range Hwasong-12, was fired at 5.58am (4.58am Singapore time) from Sunan district near Pyongyang. It flew over 2,700km, reaching an altitude of 550km before breaking up into three parts and falling into the Pacific Ocean at 6.12am, about 1,180km to the east of Cape Erimo in southern Hokkaido. The North, known as the Democratic People's Republic of Korea (DPRK), had claimed the launches were meant to put satellites into space. Without referring to the launch, state-run media Rodong Sinmun said yesterday: "The US should know that it can neither browbeat the DPRK with any economic sanctions and military threats and blackmail, nor make the DPRK flinch from the road chosen by itself." Alluding to annual joint US-South Korea war drills that are ongoing, North Korea's envoy to the UN Han Tae Song said at a UN event: "The US has openly declared its hostile intention towards the DPRK by waging aggressive joint military exercises despite repeated warnings." Noting the North has "every reason" to respond with tough countermeasures to defend itself, he added: "The US should be wholly responsible for the catastrophic consequences it will entail." The launch was condemned by countries including Singapore. In a statement, its Foreign Affairs Ministry said: "This reckless provocation is in blatant defiance of the international community and severely jeopardises the peace and stability of the Korean peninsula." It added: "We strongly urge the DPRK to cease all provocations immediately, and reiterate our long- standing call for the DPRK to abide by its international obligations and commitments." This month, the 15-member UNSC, including China and Russia, unanimously approved a seventh set of sanctions against Pyongyang, after it fired two intercontinental ballistic missiles last month. An almost month-long break between launches led Mr Trump to claim last week that North Korean leader Kim Jong Un was "starting to respect us". But this hiatus was broken last Saturday when the North fired three short-range missiles. A war of words earlier this month culminated in a threat by Mr Kim to lob four missiles into waters around the US territory of Guam. Japanese Foreign Minister Taro Kono said yesterday that by not firing the rocket towards Guam, the North could be "backing down a little".